What does it mean to be a family business? The obvious response is a business started and run by members of a family- parents and children, sometimes siblings, nieces and nephews. But the reality is that in many small businesses employees become family. In a small business you have to work together through the tough times and then celebrate the good times together. 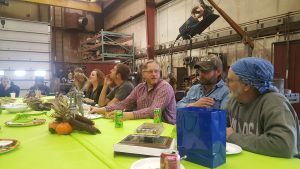 This week we are celebrating the 29 years that Dave Hinton has worked at Barnes Manufacturing and his upcoming retirement. There is always an old salt that has worked there since you have been in diapers- the person that has the knowledge and experience to educate the next generation (often named Dave). I still remember my first day at Barnes Manufacturing in 2004, I was a young woman, going to work for my boyfriend’s family in their manufacturing business. 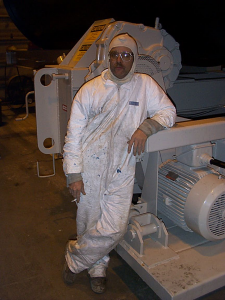 I started in the paint and assembly shop- masking parts, packing bearings, and helping wherever I could. It was in that shop I met Dave Hinton- responsible for paint, body filler, training newbies, and anything else that may come up. 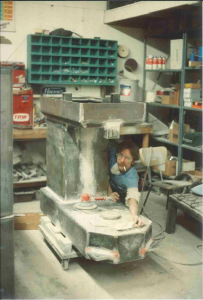 Dave started with Barnes Manufacturing in 1988, assembling bakery equipment for a large contract. Dave is a unicorn of an employee- smart, funny, and dependable. 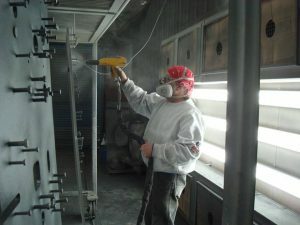 From fish-eye epoxy coatings to powder coating, he learned, adapted, and improved the processes. Most importantly, he did it while also winning as many 100.7 call in challenges as possible (and rocking an incredible mustache). I consider myself blessed to have been put in Dave’s shop, not only was he a great co-worker, mentor, and friend, he also had known my future husband since he was just a bratty little kid and had great stories to tell. 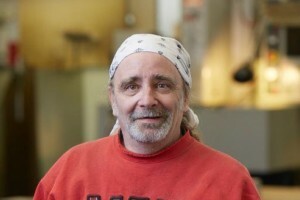 This November, after nearly 3 decades of service to Barnes, Dave Hinton is retiring. He will finally get to take some time off and relax. No more dip tanks and powder coat ovens. Though I imagine there will still be plenty of Bond-o dust as he finally gets to rebuild his treasured Chevy Berettas. We will miss seeing Dave every day, but I know we will still keep in touch. He is a part of our family and I am personally so grateful the time I have spent working with him. So from all of us at Barnes Manufacturing- Congratulations Dave!